Continued demand and strong growth expectations for the fourth quarter has led International Data Corporation (IDC) to increase its forecast for the worldwide media tablet market to 117.1 million units -- that's up from its previous forecast of 107.4 million units for the year. In their latest tablet forecast update they also revised upward the 2013 forecast number from 142.8 million units to 165.9 million units. And by 2016 they estimate that worldwide shipments should reach 261.4 million units. Clearly, media tablet adoption will be the trend to watch, as it continues to influence the way that people consume new forms of digital media. "Despite ongoing economic concerns in most regions of the world, consumers continue to buy tablets in record numbers and we expect particularly strong demand in the fourth quarter," said Tom Mainelli, research director at IDC. Apple leads the market with its iPad, and IDC expects its dominance to continue in the second half of the year. Still, they believe there is room in the market for others to find success, as new competitive products ship in the coming months and give people plenty of buying options during the holiday season. In addition to increasing the unit totals for 2012, IDC also updated its taxonomy to include Microsoft Windows-based slates. These tablets are expected to grow from about 1 percent of the market in 2011 to 4 percent in 2012, on their way to 11 percent of the market by 2016. During those same period, Apple iOS tablets will grow from 57.2 percent in 2011 to 60 percent in 2012, eventually slipping back to 58 percent by 2016. Meanwhile Google Android tablets will slip from 38.9 percent to 35.3 percent, declining to 30.5 percent by 2016. That successful apps ecosystem growth represents the single most important roadblock for Windows-based tablets to overcome -- thereby convincing independent software developers to support an additional tablet platform. "Tablets running Microsoft's upcoming Windows 8 and RT operating systems, including the company's own Surface tablets, will add some momentum," said Jennifer Song, research analyst for IDC. "However, we expect shipments to remain low in the fourth quarter as high prices and consumer confusion around these devices will limit their appeal." Also, in the second half of the year Android should benefit from the success of the Nexus 7 and Amazon's launch of new Kindle Fires. That being said, while IDC has increased its forecast for tablets in 2012, they have significantly lowered their forecast for eReaders in 2012. 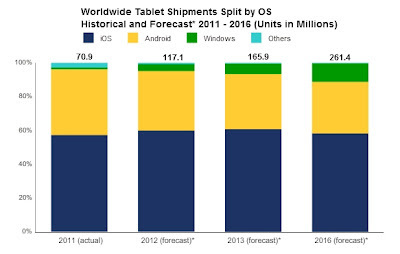 After a disappointing first half of the year, and strong indications that sub-$200 tablets are significantly impacting demand, IDC now expects 2012 shipments to top out at 23.6 million units, down from the 27.7 million units that shipped in 2011.